On this date in 1493, on his second voyage to the New World, Christopher Columbus landed on the island now called Puerto Rico, naming it San Juan Bautista (Saint John the Baptist). The first settlement, Caparra, was not founded until August 1508 (by Juan Ponce de León, a lieutenant under Columbus). November 19 is now a federal holiday on Puerto Rico called Día del Descubrimiento (Discovery Day). For Hispanic peoples the word “discovery” is apt enough, but it’s worth me stating again that it was a discovery for Europeans only. Indigenous peoples already knew it was there !! The word “discovery” is deeply ethnocentric. Unfortunately there are no longer any indigenous peoples left on Puerto Rico to protest, as there are elsewhere in the Americas. The deep irony is that the once proud and haughty slave-owning Spanish conquistadors in the Caribbean and the southeast and southwest of the U.S. have now become an exploited minority. What goes around, comes around. I suggest that white men pay attention. Ponce de León had been the leader of the Higuey massacre on Hispaniola (now Haiti and the Dominican Republic). In 1502 the newly appointed governor, Nicolás de Ovando, arrived in Hispaniola. The Spanish Crown expected Ovando to bring order to a colony in disarray. Ovando interpreted this as authorizing subjugation of the native Taínos. Thus, Ovando authorized the Jaragua Massacre in November 1503. In 1504, when Tainos overran a small Spanish garrison in Higüey on the island’s eastern side, Ovando assigned Ponce de León to crush the rebellion about which friar Bartolomé de las Casas attempted to notify Spanish authorities. Ovando rewarded Ponce de León by appointing him frontier governor of the newly conquered province, then named Higüey also. Ponce de León received a substantial land grant which authorized sufficient Indian slave labor to farm his new estate. 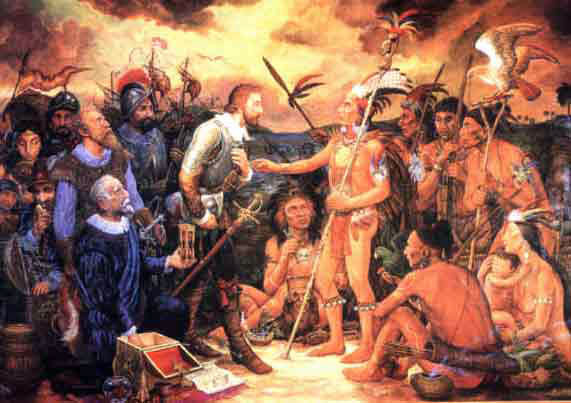 As provincial governor, Ponce de León had occasion to meet with the Taínos who visited his province from neighboring San Juan (Puerto Rico) which had not, as yet, been colonized by the Spanish. They told him stories of a fertile land with much gold to be found in the many rivers. Inspired by the possibility of riches, Ponce de León requested and received permission from Ovando to explore the island. His first reconnaissance of the island is usually dated to 1508 but there is evidence that he had made a previous exploration as early as 1506. This earlier trip was done quietly because the Spanish crown had commissioned Vicente Yáñez Pinzón to settle the island in 1505. Pinzón did not fulfill his commission and it expired in 1507, leaving the way clear for Ponce de León. His earlier exploration had confirmed the presence of gold and gave him a good understanding of the geography of the island. In 1508, Ferdinand II of Aragon gave permission to Ponce de León for the first official expedition to the island. This expedition, consisting of about 50 men in one ship, left Hispaniola on July 12, 1508 and eventually anchored in San Juan Bay, near today’s city of San Juan. Ponce de León searched inland until he found a suitable site about two miles from the bay. Here he erected a storehouse and a fortified house, creating the first settlement in Puerto Rico, Caparra. Although a few crops were planted, they spent most of their time and energy searching for gold. By early 1509 Ponce de León decided to return to Hispaniola. His expedition had collected a good quantity of gold but was running low on food and supplies. The expedition was deemed a great success and Ovando appointed Ponce de León governor of San Juan Bautista. This appointment was later confirmed by Ferdinand II on August 14, 1509. He was instructed to extend the settlement of the island and continue mining for gold. He returned to the island, bringing with him his wife and children. Ponce de León parceled out the native Taínos amongst himself and other settlers using a system of forced labor known as the repartimiento system, under which natives were distributed to Spanish officials to be used as slave labor. On December 27, 1512, under pressure from the Roman Catholic Church, Ferdinand II of Aragon issued the Burgos’ Laws, which modified the repartimiento into a system called encomiendas, aimed at ending the exploitation. The laws prohibited the use of any form of punishment toward the indigenous people, regulated their work hours, pay, hygiene, and care, and ordered them to be catechized. 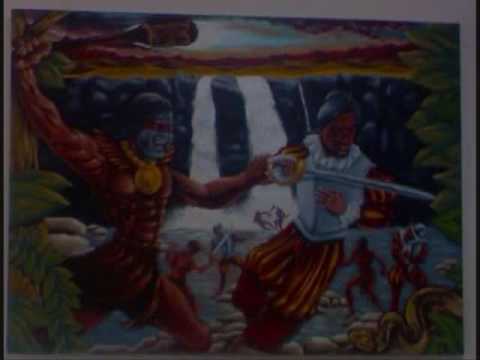 In 1511, the Taínos revolted against the Spanish. Cacique (chief) Urayoán, as ordered by Agüeybaná II, had his warriors drown the Spanish soldier Diego Salcedo to determine whether the Spaniards were immortal. After drowning Salcedo, they kept watch over his body for three days to confirm his death and then revolted. The revolt was easily crushed by Ponce de León and within a few decades much of the native population had been decimated by disease, violence, and a high rate of suicide. As a result, Taíno culture, language, and traditions were generally destroyed, and were claimed to have “vanished” 50 years after Christopher Columbus arrived. The Roman Catholic Church, realizing the opportunity to expand its influence, also participated in colonizing the island. On August 8, 1511, Pope Julius II established three dioceses in the New World, one in Puerto Rico and two on the island of Hispaniola under the archbishop of Seville. The Canon of Salamanca, Alonso Manso, was appointed bishop of the Puerto Rican diocese. On September 26, 1512, before his arrival on the island, the first school of advanced studies was established by the bishop. Taking possession in 1513, he became the first bishop to arrive in the Americas. Puerto Rico would also become the first ecclesiastical headquarters in the New World during the reign of Pope Leo X and the general headquarters of the Spanish Inquisition in the New World. As part of the colonization process, African slaves were brought to the island in 1513. Following the decline of the Taíno population, more slaves were brought to Puerto Rico; however, the number of slaves on the island paled in comparison to those in neighboring islands. Also, early in the colonization of Puerto Rico, attempts were made to wrest control of Puerto Rico from Spain. The Caribs, a raiding ethic group of the Caribbean, attacked Spanish settlements along the banks of the Daguao and Macao rivers in 1514 and again in 1521 but each time they were easily repelled by the superior Spanish firepower. The rest, as they say, is history. The other European powers realized the potential of Puerto Rico and attempted to wrestle control of it from Spain for centuries. Successes were small and varied in intensity, but ultimately Spain retained control until the late 19th century. In 1890, Captain Alfred Thayer Mahan, a member of the Navy War Board and leading U.S. strategic thinker, wrote The Influence of Sea Power upon History in which he argued for the creation of a large and powerful navy modeled after the British Royal Navy. Part of his strategy called for the acquisition of colonies in the Caribbean. These would serve as coaling and naval stations, as well as strategic points of defense after construction of a canal in the Panama Isthmus. 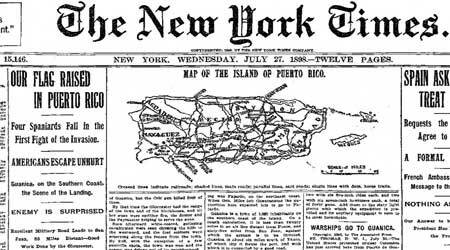 Since 1894, the Naval War College had been formulating plans for war with Spain and by 1896, the Office of Naval Intelligence had prepared a plan which included military operations in Puerto Rican waters. 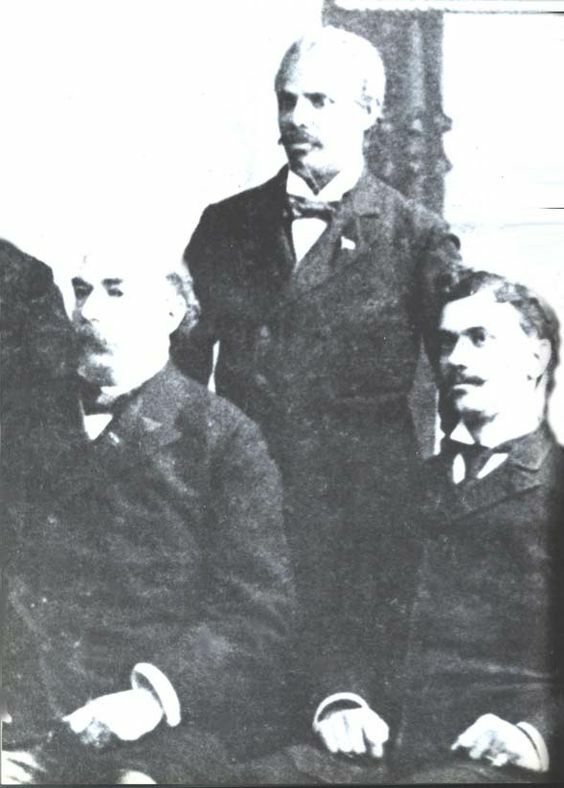 On March 10, 1898, Dr. Julio J. Henna and Robert H. Todd, leaders of the Puerto Rican section of the Cuban Revolutionary Party, began to correspond with United States President William McKinley and the United States Senate in hopes that they would consider including Puerto Rico in the intervention planned for Cuba. Henna and Todd also provided the US government with information about the Spanish military presence on the island. On April 24, Spanish Minister of Defense Segismundo Bermejo sent instructions to Spanish Admiral Cervera to proceed with his fleet from Cape Verde to the Caribbean, Cuba and Puerto Rico. In May, Lt. Henry H. Whitney of the United States Fourth Artillery was sent to Puerto Rico on a reconnaissance mission. He provided maps and information on the Spanish military forces to the US government that would be useful for an invasion. 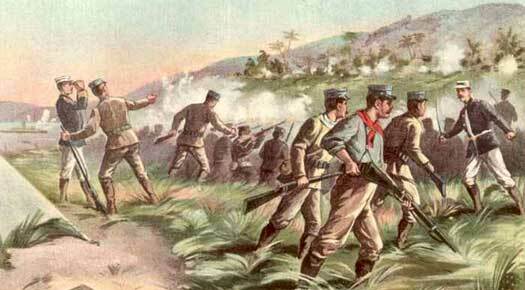 The Spanish–American War broke out in late April 1898. The US strategy was to seize Spanish colonies in the Atlantic—Puerto Rico and Cuba—and their possessions in the Pacific—the Philippines and Guam. 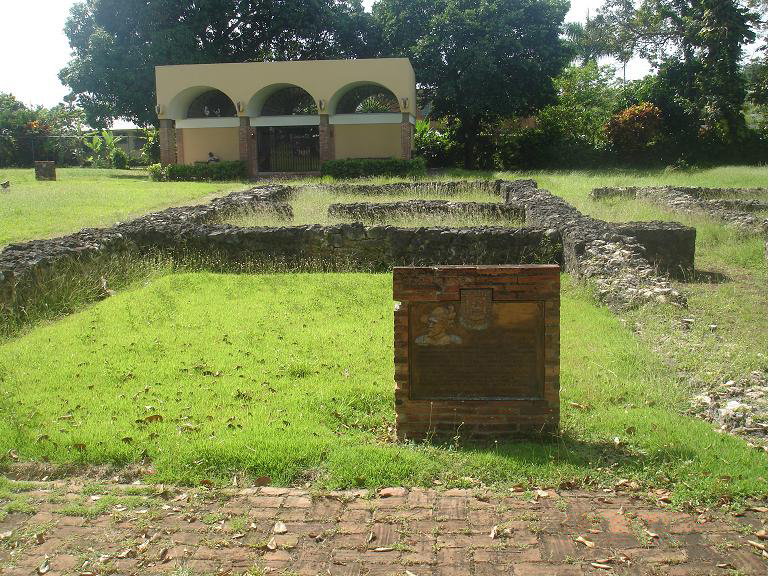 On May 10, Spanish forces at Fort San Cristóbal under the command of Capt. Ángel Rivero Méndez in San Juan exchanged fire with the USS Yale under the command of Capt. William C. Wise. Two days later, on May 12, a squadron of 12 US ships commanded by Rear Admiral William T. Sampson bombarded installations at San Juan. On June 25, the USS Yosemite blocked San Juan harbor. On July 18, General Nelson A. Miles, commander of US forces, received orders to sail for Puerto Rico and to land his troops. On July 21, a convoy with nine transports and 3,300 soldiers, escorted by USS Massachusetts, sailed for Puerto Rico from Guantánamo. General Nelson Miles landed unopposed at Guánica, located in the southern coast of the island, on July 25, 1898, with the first contingent of American troops. Opposition was met in the southern and central regions of the island but by the end of August the island was under United States control. On August 12, peace protocols were signed in Washington and Spanish Commissions met in San Juan on September 9 to discuss the details of the withdrawal of Spanish troops and the cession of the island to the United States. On October 1, an initial meeting was held in Paris to draft the Peace Treaty and on December 10, 1898, the Treaty of Paris was signed (ratified by the US Senate February 6, 1899). Spain renounced all claim to Cuba, ceded Guam and Puerto Rico and its dependent islets to the United States, and transferred sovereignty over the Philippines to the United States and in turn was paid $20,000,000 ($570 million in 2016 dollars) by the U.S. General John R. Brooke became the first United States military governor of the island. Henceforth Puerto Rico was under U.S. control and now one of the simmering issues is whether Puerto Rico should become the 51st state (or 52nd if Washington D.C. gets statehood). Puerto Rican cuisine has been influenced by an array of cultures including the Taino, Spanish, and West African, in earlier times, and the United States more recently. Puerto Rican cuisine shares a lot in common with other Caribbean and Latin American cuisines, but, of course, is distinctive and has found its way to the United States and beyond following emigrants. Locals call their cuisine cocina criolla. By the end of the 19th century, before U.S. control, traditional Puerto Rican cuisine was well established. El Cocinero Puertorriqueño, the island’s first cookbook, was published in 1849. 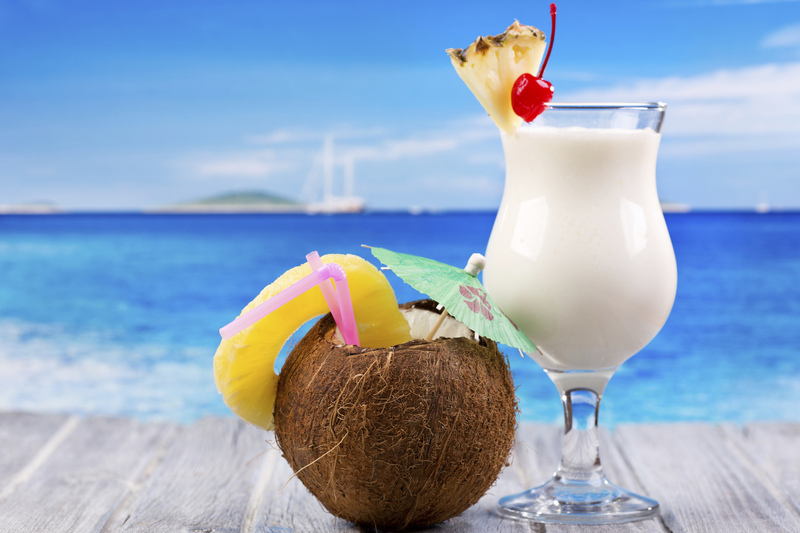 The piña colada originated in Puerto Rico in the 19th century is now the national drink. One distinctive sauce from Puerto Rico is mojito isleño which most likely originated in Salinas nicknamed “La Cuna del Mojito Isleño (the cradle of mojito isleño). It is used primarily over fish and shellfish, but can be used with meat or pasta if you want. It is similar to the sauce used in Italy for spaghetti alla puttanesca. Heat the olive oil in a large skillet over medium heat, pour in oil and sauté the bell pepper and onion until soft but not browned. Add the garlic and cilantro, and season to taste with salt and pepper. Cook five minutes over low heat. Cook, stirring occasionally, for 1 minute. Add the crushed tomatoes and simmer for about 10 minutes. You can add hot sauce to taste if you wish. Add the olives, stir to combine and remove from the heat. 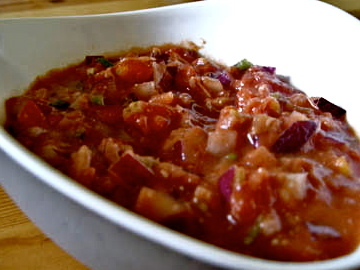 You can use the sauce warm over fish, meat, or pasta, or chilled as a dip. Yield: 8 servings for main dishes.